Keep Your Business Running Smoothly With Annual Maintenance. Taking care of your commercial building is a huge undertaking, so the last thing you want to worry about is something going wrong with your plumbing. 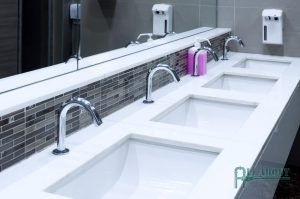 We are commercial plumbing experts and provide a wide range of commercial plumbing services so that you know that you can count on us when you need it most. Because commercial plumbing is so widely needed, we offer 24-hour service, because when you have a plumbing emergency, you don’t have time to wait for someone to come help you. We will be there to get the job done as quickly and efficiently as we can. Our company, All About Plumbing & Septic, is dedicated to providing high-quality plumbing at a great price. All of our plumbers are expertly trained, experienced, and licensed for your peace of mind and satisfaction. We are always available to answer your plumbing questions and get help to you as soon as possible. We also recommend that you have regular maintenance done on your plumbing system to help prevent any problems that could come up in the future. Over time, clogs can develop in your drains and sewer lines, that can turn into serious backup problems. When you are running a business, that is not something you have time to deal with. We want to prevent those types of issues before they are even able to develop. When you have a need for commercial plumbing in Mills River, Hendersonville, and Asheville, NC, call us at 828-778-2425 and we will be able to set up an appointment time that works best for you or try to get out to see you that same day. Problems with plumbing in commercial buildings are very common. That is because there are usually many people working there that use the bathroom, run water, or throwing items away that should not go into drains. That means that clogs can begin to develop rather quickly compared to residential homes. Some commercial companies choose to do hydro jetting every year or so, so that they can prevent clogs from forming and keep everything flowing the way that it should. We can help you with that and can actually do your maintenance for you, annually. Leaking is something we always want to be careful within a commercial setting. One leak can throw off the whole system and in such large buildings, leaks can sometimes be hard to find. We use state-of-the-art technology and experience to help us find leaks and get them repaired as quickly as possible. Realizing that you have a leak in your commercial building can be difficult as well. One good way to realize that something like this is going on is, to pay attention to your water bill. If your water bill is increasingly higher every single month, it could be a sign that there is a leak somewhere. We also want to make sure that there is not a slab leak that is happening because that can cause serious damage and a lot of money of it is not taken care of. If you need commercial plumbing in Mills River, Hendersonville, and Asheville, NC, make sure you call our professionals at All About Plumbing & Septic, by dialing 828-778-2425. The maintenance of your commercial plumbing system is very important. You want to stay on top of the problems that could happen, rather than dealing with them after the fact. A few ways to do this is to have hydro jetting done as a preventative measure instead of having it done only when there is an issue. This can help get your pipes cleared out and working like new again. Another great option is to do a maintenance plan with us so that you don’t have to remember to call us for check-in appointments; we will let you know when it is time to get services done that way it is one less thing to worry about. This can prevent backflow, leaks, fixture issues, and even problems with your water heater. If you are in the process of building a new commercial building or are doing renovations and need plumbing installation, we can help you. Making sure that your plumbing is installed correctly will set the foundation for the rest of the time you are in that building. You want to find a contractor that you can trust to get the job done the right way the first time. Our plumbers are all licensed and have experience in this field so you can trust that they know what they are doing. Give us a call, and we will be able to give you a quote for what you need to have done. We can also come out to the spot and see for ourselves what is going on and what will need to be done. Call us at 828-778-2425 for commercial plumbing in Mills River, Hendersonville, and Asheville, NC. Updated on January 21, 2019 at 4:41 pm by All About Plumbing.